These are unusual member of the auk family, often nesting far inland in forests or on mountain tops. 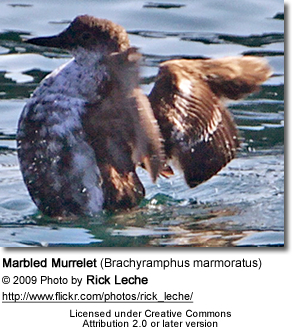 The Long-billed Murrelet was considered conspecific (of, or belonging to, the same species) with the Marbled Murrelet until 1998, when Friesen et al showed that the mtDNA variation was greater between these two forms than between Marbled and Kittlitz's Murrelets. These species breed in the subarctic North Pacific. They tend to remain coastal in winter, either staying near the breeding grounds, or, in the case of Long-billed, migrating to the coast of Japan. These are small chunky auks, no more than 25 cm long. Like other auks, they have plumage that varies by season. The non-breeding appearance is typically white underneath with mainly black upperparts. The breeding plumage is distinctive in this group; most auks are strongly contrasted with black and white when breeding, but Brachyramphus species are mainly brown, with pale feather edges giving a scaly appearance; the central underparts, normally below the surface on a swimming bird, are white. 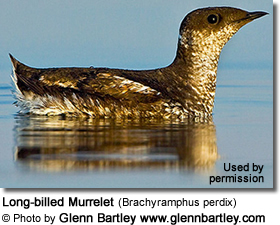 These murrelets feeds at sea on small fish, larval fish, krill and other small zooplankton. Chicks are fed with larger fish carried in the bill. The breeding behaviour of this genus is very unusual. Unlike most other seabirds, they do not breed in colonies or even necessarily close to the sea, instead nesting, depending on species, on branches of old-growth conifers, mountaintops, or on open ground. They lay one egg on bare ground or on a thick lichen- or moss-covered branch or hollow. The egg is incubated for a month, then the chick is fed for around 40 days until it fledges and flies unaccompanied to the sea. Breeding success is low and chick mortality high. 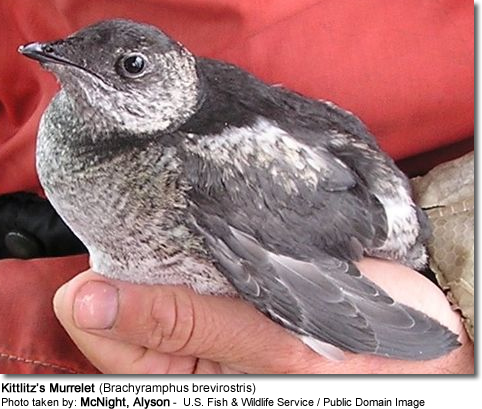 All three Brachyramphus murrelets are globally threatened and declining in numbers. The biggest threat are the loss of nesting habitat, due to the loss of old growth forest to logging and retreating, entanglement in fishing gear and oil spills. Friesen et al., Evidence from allozymes and cytochrome b sequences for a new species of alcid, the Long-billed Murrelet, published in Condor.